World's First Tee with Zero Contact at Launch! Mirror XD17 Tee - Xplosive Impact - XD17 Distance! Increase ball speed 5 mph! Improve launch angle 0.6 degrees! Decrease back spin by 300 rpm and side spin by 500 rpm! Increase penetrating ball flight for unmatched distance! Improve ball compression dynamics with 17 degrees forward lean! Increase higher distance gains at 110+ mph! Remain durable shot after shot! Conforms to USGA and R&A Rules! Click the play arrow to listen to this MP3 of Steve Riggs' interview about the Mirror XD17 Tee® with inventor Mark Chantal, and Peter Murphy DOI for Hank Haney Golf for 15 yrs. and national team coach for Team Morocco, China, India, Venezuela & Japan, with Ken Collins Golf Digest 2011 Top 100 Clubfitter. I've seen a huge difference in ball flight and roll, especially into the wind! I believe the XD17 tee will change my game on the PGA Tour in 2013. The technology behind this tee has increased my driving distance more than 20 yards and improved my accuracy tremendously. My good friend / coach Peter Murphy introduced me to the XD17 tee. I seen a huge difference in ball flight and roll, especially into the wind. If you're looking for more accurate and longer shots there is no better product being used on the PGA Tour than the XD17 Tee. It's awesome!!! It is a must have for any golfer! The XD17 Tee produces one of the flattest ball flights I’ve ever seen with a driver. You know as soon as the ball hits the ground you’re going to get exceptional roll and increased distance. The match between the Mirror Tee®, my R11 and the Penta golf ball is as good as it gets! I have never used a golf product that produces such a wow effect on the golf ball like the Mirror Tee®. As an instructor I am always looking for a product that will help my students. From students on the PGA Tour to amateur and junior golfers, I have seen an increase in distance from 15 to 40 yards on their drives. If you want to see the difference that Mirror Tee® can add to your drives then don't wait any longer. Mirror Tee® will change golf around the world by making the game easier to hit longer and straighter. This is the tee of the future. I have used the Mirror Tee® with professional and amateur golfers and seen reduced spin rates- that is a big key in gaining yards without technique changes. We use the Mirror Tee® exclusively in our Junior Academy and they love the tees for their style and durability! This is the tee of the future. I will use the XD17 tee with all the students at my academy! incredible! I will use the XD17 tee with all the students at my academy! ...the forward tilt of the tee does make a difference! The upcoming Scotland vs England Ryder Cup match will be our third disabled golf international using the Mirror Tee's. We first came across the product in early 2010, we tried them out for our Scottish Open Championship followed shortly by a World Team Cup where over one hundred disabled golfers from over a dozen countries used the Mirror Tee's. Personally, I've never broken one yet, we've used them during two recent trips to the US, again in Canada and the forward tilt of the tee does make a difference! The SDGP has organized the "Auld Enemies Cup" for October this year and the Mirror Tee Works company has provided Team Scotland with the increasingly popular tees to play the challenging Priestman Course at Slaley Hall. Thank you Mirror Tee Works company from an appreciative Team Scotland! Also my ball flight improved dramatically! It's a great product! I found them easy to use while placing the tee at a forward angle. In terms of results, I noticed about 12-18 yards extra roll on my tee shots when they landed, also my ball flight improved dramatically! "They teed their balls up with the new Mirror Tee® and conventional Golf Tee, and let it rip. We measured these drives, using the same Titleist Pro-V1 golf ball, and the ball was consistently flying further with the Mirror Tee® Golf Tee and this was even more evident into the wind, when there was far less spin. I don't know the full technology behind the Mirror Tee® Golf Tee, but I do know that it really worked for us and its the only golf tee I'll use. Why don't you give it a try and tell us what you thought by e- mailing me at golfbloggeruk@googlemail.com." 3) 100% full compression/position of tee at launch! Place your secure order here. 4 tees per pack ONLY $9.99 with *FREE shipping! Simply enter the quantity of packages and BUY NOW! 1) First thing I noticed the ball felt softer at impact. 2) The ball does penetrate the air better. I was hitting into a stiff 20mph wind and could see the difference. When I walked to the end of the range I saw I was gaining 10 to 20 yards distance. I'm seeing an honest 10 to 20 yards increase when solid contact is made. I use the same Mirror Tee® every time and have not broken one yet. I hit a minimum of 100 drives a day six days a week. I can snap other high performance tees in one swing. Thanks for a product that really delivers! Thank you so much for introducing me to the Mirror Tee XD17. I love it!!!! I have won 6 of my last 8 Hurricane Junior Golf Tournaments this year! My yellow XD17 tees are holding up well. I'm about a 20 handicap player that had a hard time breaking the 90 mark, My first 4 rounds with the Mirror Tee were all under 90, I hit my all time best scores,ie: 78 82,84,85! I know it's not just the tee but the confidence that builds after hitting longer straighter drives with it is obviously better than without it! Click to see the big picture! GREEN Product; Reuseable; Facilitates maintenance - SAVES TREES! Great Gift for Golfers! For Birthdays, Holidays, Anytime! ...helped me get back my driving distance! 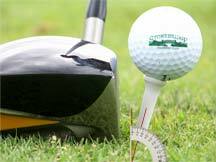 "The Mirror Tee® Golf Tee has improved my trajectory and helped me get back my driving distance!" ...I will never use anything else. "The first time I was approached about the Mirror Tee® Golf Tee I thought it was just another gimmick. I then used it for a round and was shocked to see the results that it gave me. The ball came off the the club face with a higher trajectory and more solid impact. I found that it was easier for me to concentrate and keep my head still when focusing on the back of the golf ball. With the different degrees that you can lean the tee forward it's a big advantage for players who struggle to reach the correct launch angles. In my opinion this product is a home run for all golfers and abilities. I will never use anything else!" I would like to take this opportunity to thank you for introducing me to the mirrortee. I truly believe that this tee has made a huge difference to my game. I have never hit a ball so far or straight before using the mirrortee. Only yesterday I played in a Corporate Day at my local golf course Coolangatta Tweed and took out the Longest Drive (women's) on the day. My secret weapon was the Mirrortee......Thank you Mirrortee !!!! ...and now it's the only tee I'll use. "They say that good things come in small packages and recently I was reminded of how true that cliche really is - even in golf. Last month I was vacationing in Maui and played a round of golf at Ka'anapali with my new galpal, Shelley, and her friend, Tony. I expected my game to be a bit rusty, having not played in a month, but my drives were some of the best I had ever hit. Shelley started calling me a sandbagger and I kept saying, "No, no, really...I never hit my drives that far! It must be these new tees I just got." So then Tony said, "Okay, let me try one." I gave him one of the few white ones I had and Shelley one of the pinks. And on the next hole, when Shelley told us we needed a "far far away club" ;), Tony teed up his ball with his new Mirror Tee and let it rip. The day was full of drives like that from all of us and it wasn't long before Tony was asking me for as many tees as I could spare. Not that he needed many - I played 13 rounds of golf with just 1 Mirror Tee® and it's still as good as new. Now I don't know all the technology behind the Mirror Tee®, but I do know that it really worked for me. I shot my best round of my life on Lana'i using that 1 tee and now it's the only tee I'll use. I'm putting them in the Xmas stockings of all my golf buddies this year. I know they will thank me when they "tip it and rip it" on their next drive." ...Many like the way it performs over a traditional tee! "Several of our players have tested the XD17 and many like the way it performs over a traditional tee. It offers a consistent method for teeing the ball and the launch, spin, and distance seems to perform in a consistent pattern." ...mirror tee works has done it. FINALLY. These tees are the best way to add yards to your tee shots without changing a single thing in your swing; allowing the ball to absorb the total energy transferred from the face. The principle is something the manufacturers have been trying to develop for a long time and Mirror Tee® works has done it. FINALLY. I have played the same course for many years. I've used the same clubs and balls that I have used this entire season. The average distance gains on my drives were between 15 and 20 yards, More significant to me however is there was less side-spin and the ball flight was more piercing with more roll-out than I've ever experienced. As you promised, It only took one or two times to learn how to tee the ball; It was very intuitive. The Mirror Tees are now permanently in my bag and will be for a very long time. Thank you. Almost instantaneously I've seen a difference! I tried them last year at the Scottish Amateur Championship. Almost instantaneously I've seen a difference and now wouldn't use another tee. Cannot wait for my order to get here. No golfer should be without them! Thank you! From now on I will be using only this tee due to the obvious benefits of straighter and longer golf shots! No golfer should be without them -Especially those seniors who feel with each passing year the greens keep moving further away from the tees. I have seen an increase in yardage as well as a more penetrating ball flight and I love it! I have been using the Mirror Tee since this past January and I must say I'm a customer for life. I have not used another tee since putting the Mirror Tee in the bag and don't plan on ever using the traditional type tee ever again! With the Mirror Tee I have seen an increase in yardage as well as a more penetrating ball flight and I love it! As a Professional, it is important for me to find something that I know will work day in and day out and the Mirror Tee is the answer! Thank you so much for helping out with my game and I look forward to seeing what I can accomplish this upcoming year using the Mirror Tee! God Bless. March 2013 Article About the Mirror Tee here! ...can't wait to see the Iron Byron results. I've always tried to lean my tees forward to enhance and lower ball flight. Thank's to the Mirror Tee® it's easier to lean it when teeing up. This golf tee increases my top spin as I fly the ball 300-315 and achieve 10-15 yards of roll; now I see my ball bounce and roll. I can't wait to see the Iron Byron results. One golf tee for repeated rounds of golf "Priceless". I would imagine most dislike the look of broken tees on the course as I do; The Mirror Tee® is my contribution to this issue. ...one of the best advances in golf technology. "I've professionally tested and written about golf training aids and equipment for many top brands in my career. I can honestly say that the Mirror Tee® is one of the best advances in golf technology that I have ever seen. The golf ball seems to explode off the tee at contact and the increase in my distance is measurable. I no longer fear the wind on the tee deck and approach each drive with the utmost confidence. The durability of the Mirror Tee® is astounding as I have yet to break one. This is one golf innovation that will have a permanent residence in my bag." It gives me the opportunity to score better. 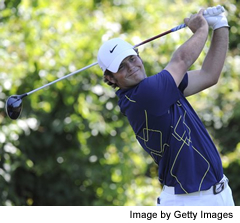 I'm a professional golfer from Scone, Scotland. I first used the Mirror Tee® in Morocco when I met Peter Murphy. I am pretty skeptical about these things. Anyways, I took one out for 9 holes and I could feel the difference at impact! I didn't miss a fairway. Since then I have played a bunch of tournament rounds on the European Challenge Tour. My feeling on the Mirror Tee® is my good drives the ones which would normally hit the fairway still hit the fairway. The Ok drives which would be the edge of fairway/semi rough now hit the fairway. The poor drives the ones with no chance of hitting the fairway are now ending up on the edge of the fairway or in the semi rough. The most important thing the Mirror Tee® does for me is that it allows me to play an aggressive approach shot on every hole from the fairway or semi. It gives me the opportunity to score better. ...I am getting more distance and also more consistantcy in my drives. I ordered earlier this year from your site. The tee's are fantastic! Easy to set the ball on and easy to find the tee after you swing! My 78 year old Mother says she loves these tee's because they are so easy to tee the ball on. I'm believing I am getting more distance and also more consistantcy in my drives. Many more drives in the fairway for me! I think you found a customer for life! I love the tee's for the extra distance, also they're so durable! This is my second time around, and I'm 100% satisfied! ...They really work! Thank you! ....my drives are 20+ meters longer! It works......very crazy, my drives are 20+ meters longer, last week in our club tournament I won the longest drive trophy at approximately 310m / 339 yards. Thank you! they have over their opponents when using the Mirror Tee. Not only do they gain the distance because of the better ball flight, but they hit more fairways because of their confidence! ...a measurable advantage over the standard tee. "The Mirror Tee® had a measurable advantage over the standard tee. My drives and 3 metals were traveling a bit further when hit side by side at the range. The Mirror Tee® also made it through the entire bucket of balls, whereas several standard tees snapped during my practice session." "My Mirror Tee® lasted through the entire scramble." Three birdies today - due to 20 to 30 more yards off the tee! My new Mirror Tees are a BIG SUCCESS!!! I've played four rounds with scores: 79, 80, 78, and 77 today - my 9.5 handicap is coming down!!! Three birdies today - due to 20-30 more yards off the tee. I'm smoking my driver down the middle almost every time. I used the same tee - AND - the same Titleist NXT Tour ball for the past four rounds. WOW!!!! I've been playing with the same guys for years and know who out drives me and who doesn't. now have just 2 in my pocket. By the way, I've picked up at least 10 yards on my drives. I've been playing with same guys for years and know who out drives me and who doesn't. I'm now out there with the longest drivers. I always feel compelled to compliment great products and you have one, thanks! I just wanted to let you know I love these Mirror Tees! Just finished my 25th round of the season and I've noticed a considerable amount of forward roll with my drives now. The extra distance allows me to play more comfortable shots, and save some strokes. Thanks for a great product! I have used the mirror tee and I am amazed at how well the tee functions. I never reach into my golf bag for more tees. I am sure that other people will appreciate the design and also the endurance of the mirror tee. Keep up the great work. Bill Barry - Manchester N.H. I recommend using these tees without reservation. I used the Mirror Tees for the first time today! Wow! I hit noticeably farther while maintaining accuracy! It's also quite simple to put the tee in the ground at a tilt. The ball fits nicely to set you up for a wonderful shot. I recommend using these tees without reservation. ...this tee gives me, advantage! "On the golf course I feel I need every advantage I can get and that is exactly what this tee gives me, advantage!" ...these tees will always be in my bag. "First of all let me thank you for introducing me to the Mirror Tee® Golf Tee. It's nice to find a piece of equipment that actually performs as promised. Being an average golfer (16 handicap) I'm always keeping my eye out for anything that might give me an edge. But a golf tee? Who would of thought it. The advertising said the tee can be leaned forward as much as 17.5 degrees. I thought ...ok...that makes sense; if the tee is already leaning forward then it will come out of the ground with little or no resistance when I hit it with a club. But I was in for a surprise when I addressed the ball for the first time. By leaning it forward so much you can see the tee. It's like an arrow under the ball pointing in the direction you want to hit the ball. But, more than that, it gives me something to aim for under the ball. So instead of the line drives I usually hit I am finally getting them up in the air. Hey! I still have to keep my head down. But this has helped me stay with it more consistently. These tees will always be in my bag. Again, thanks." questions or concerns, contact us using the information provided below. Please visit us again! U.S. Patent #5.571.054. Mirror Tee® and XD17™ are registered service marks of Mirror Tee Works, LLC.